A team of 35 scientists around the world are working on curbing food waste using hexanal, a naturally occurring plant compound, to reduce fruit spoilage. This story was written for my column, Eating Niagara, which runs every second Wednesday in the St. Catharines Standard, Niagara Falls Review and Welland Tribune. Shanthanu Krishnakumar understands how disappointing it is to sink your teeth into a mealy peach. The University of Guelph master’s student knows that people want every bite of a Niagara peach to send juice running down to their elbows. So he’s been working in local peach and nectarine orchards for the past year and a half to keep grainy, gritty, dry stone fruit to a minimum. In the process, Krishnakumar is helping a team of 35 scientists around the world to solve one of the most serious economic and environmental problems on the planet: food waste. The secret? Harnessing the power of a plant-derived compound called hexanal. 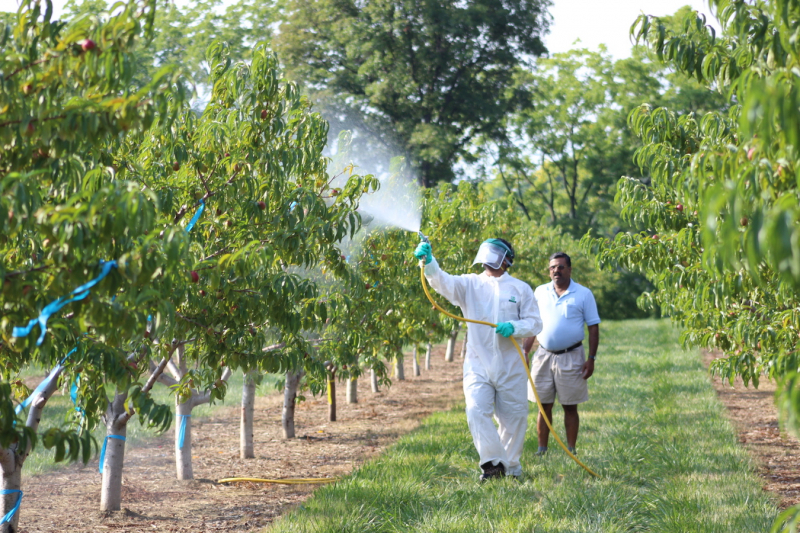 Hexanal already exists in plants to protect them from insects, but when applied topically to fruit, including Niagara peaches and nectarines, it can delay spoilage for weeks. Krishnakumar has been working with local tree fruit breeder Jayasankar Subramanian on his findings. Their work is part of a four-year global study of hexanal use and its benefits before and after harvest. The Canadian International Food Security Research Fund contributed $4.2 million to the project. Hexanal’s anti-aging effects on fruit have long been known academically, Subramanian said. He and another scientist, Gopinadhan Paliyath, experimented with it on Niagara sweet cherries in 2007. That research would have remained local and relied on academic publications to spread the word if it weren’t for funding from the Food Security Research Fund to experiment with hexanal elsewhere in the world, Subramanian noted. The study is a chance to prove the safe plant product works on a commercial scale. “Originally this was done to help our growers but when we realized there were other opportunities, we thought ‘Why not?’” he said.